According to paleontologists from the University of Michigan, one local farmer may have made an epic fossil find. James Bristle of Lima Township was digging in a soybean field Monday when he and his friend pulled up what they first thought was a bent, muddy old fence post. But it was actually the rib bone of an ancient woolly mammoth. “We knew it was something that was out of the norm,” Bristle told the Ann Arbor News. On Wednesday, University of Michigan professor Daniel Fisher — who’d been contacted via the university by Bristle and his friends — was able to go out and confirm the find. Fisher believes that the mammoth died between 11,000 and 15,000 years ago. Most mammoths were gone by 10,000 years ago, though a few small populations persisted until much more recent history. “We get calls once or twice a year about new specimens like this,” Fisher told The Washington Post. 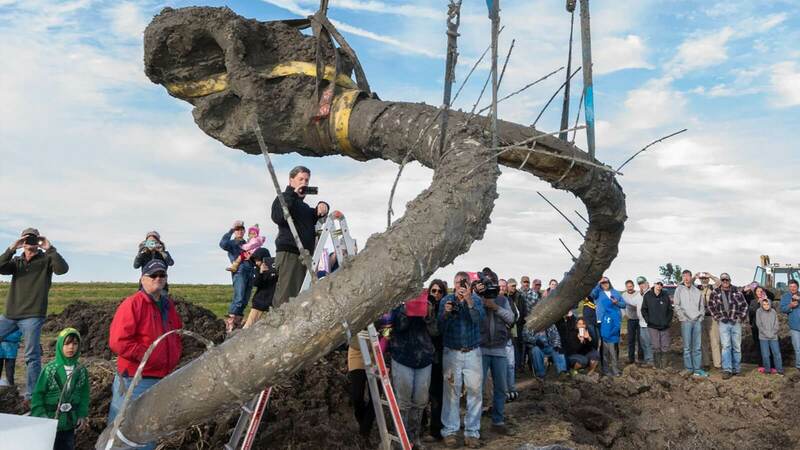 A mammoth skull and tusks are lifted from the ground at a farm southwest of Ann Arbor, at an unincorporated site in Washtenaw County, Michigan. But they’re usually mastodons. It’s a bit more unusual to find a mammoth, the group more closely related to modern elephants. After establishing that Bristle could only spare one day for the mammoth extraction, Fisher and his team went into overdrive. On Thursday they were deep in the muck, doing their best to carefully document and extract the bones at top speed. There are a few things that make this particular mammoth exciting: It’s a very complete skeleton (although it is missing its hind limbs, feet and some other assorted parts), compared with most of the mammoths found in Michigan and surrounding areas. And because it has been carefully extracted by paleontologists, the bone has the potential to be studied much more thoroughly than those that are haphazardly pulled out of the ground. As the mammoth skull and tusks are raised from the pit, paleontology doctoral candidate John Fronimos watches.“We’ll have the potential to say way more about this specimen,” because of the careful excavation, Fisher said. Already, he believes he sees evidence that humans interacted with the beast. “We think we’re dealing with an animal that was at least butchered by humans,” even if the humans didn’t kill it, Fisher said. He believes the carcass was placed in a pond — a practice he’s observed evidence of at other dig sites in the area. “It was essentially stored meat,” he said. Fisher doesn’t have quite as much evidence as he’d like to confirm that theory, but he hopes that the bones will yield more information. “It’s really the landowner’s call now,” he said, explaining that Bristle now owns the bones. Normally, Fisher explained, the university wouldn’t have put resources into excavating remains without some reassurance that they’d be donated for research. But because these were under such a time crunch, Fisher and his colleagues decided to swoop in. He said on Friday that Bristle has yet to give a verdict on the fate of the bones. Aliens In The Book Of Enoch Tells Another Tale Of The Pyramids!